What is lossless music player software and which one should i choose? Here now install the best lossless audio music player software - 5KPlayer on your Windows and Mac computers and turn them into robust Hi-Fi music player device. You can enjoy all the high quality large lossless music files in various formats free or even wirelessly. 5KPlayer – Free Lossless Audio Player for Mac/WindowsThis lossless music player can play HD lossless audio up to 24bit/193kHz in FLAC, DTS, APE & M4A etc. With built-in 5.1 surround sound AirPlay function, users can also enjoy wireless audio streaming free. Converts lossless audio formats to MP3 AAC. Hardware acceleration for hi-res audio decoding. Supports 5.1 surround sound audio AirPlay. What is High Resolution Lossless Audio Player Software? As the name suggests, it is a player that supports playback of HD lossless audio! High-resolution audio aka high-definition audio or HD audio, generally refers to audio signals with bandwidth and/or dynamic range greater than that of Compact Disc Digital Audio (CDs) – sampling rates greater than 44,100 Hz and with bit-depths greater than 16. These HD audio files are closer to the original sound with clearer effect. From the earliest HDCD attempt in 1995 to Pure Audio Blu-ray, to High Fidelity Pure Audio in 2013, the HD audio keeps evolving to higher standard. And gradually developed many file formats capable of storing high-resolution audio including FLAC, ALAC, WAV, AIFF and DSD. FYI, HD audio files are generally made lossless. Lossless Audio refers to the audio file that can be decompressed to an exact digital duplicate of the original audio stream, therefore far less compression would be conducted in comparison with lossy audio, which makes it way bigger than the regular files. Lossless formats like Free Lossless Audio Codec (FLAC), Apple's Apple Lossless (ALAC), MPEG-4 ALS, Microsoft's Windows Media Audio 9 Lossless (WMA Lossless), Monkey's Audio, TTA, and WavPack are commonly used for storing. Therefore, HD lossless audio player software should at least support the above all formats and can render the audio quality to the closest state to the original. 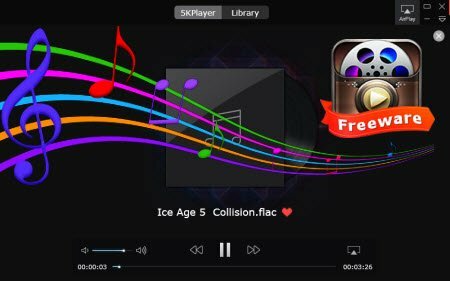 5KPlayer is one of the best free HD lossless audio players that supports FLAC, ALAC, WMA Lossless formats with bless of hardware acceleration feature to boost its decoding efficiency. Since lossless audio files are commonly larger than the average, hardware decoding would be a better option than software decoding which can consume most of your CPU usage. This lossless music player can also play back lossy audios like MP3, M4A, ACC and video formats including 3GP, MP4, FLV, WMV etc. Apart from the above audio playback features, this lossless music player also supports high-res video playback up to 4K 8K in 3D. Music lovers can free download online latest hot single releases in MP3 or MP4 MV and convert them to MP3 ACC. Paired with wirless AirPlay speakers, your enjoyment can extent to wider space. 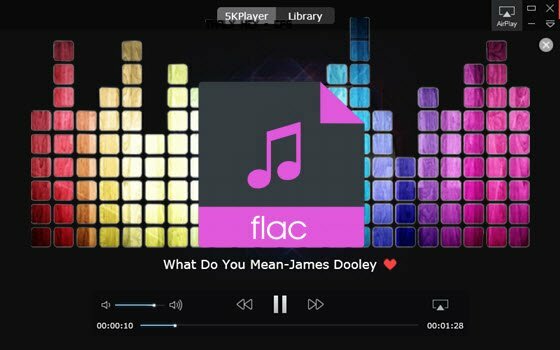 The best free FLAC player is recommended here, aiming to help play lossless FLAC music files ripped from CD or downloaded online on Windows and Mac OS.